Microsoft PowerPoint is the undisputed king of presentations. For so many years now PowerPoint has been the go-to tool for both students and businesses looking to educate their audience through a digital presentation. But for many students and working professionals, Microsoft PowerPoint although effective, falls short on the creative front. If you have Microsoft Office, then you have PowerPoint. You either love it or loathe it. Since you stumbled upon this blog, it’s fair to say it’s most likely to be the latter. So for those of you looking to change things up, we have put together a list of our top 10 favorite Microsoft Office PowerPoint alternatives for you to try out on your next assignment or sales pitch! At the top of our list is the interactive tool, Prezi. Prezi is an alternative which makes use of just one slide rather than multiples ones. Unlike PowerPoint, Prezi is a presentation software which allows you to zoom into several sub-topics rather than alternating through slides. Like Moovly, Prezi is a cloud-based presentation software, meaning you can access your presentations across multiple platforms. Although Prezi is a quality presentation tool and a fine PowerPoint alternative, it comes at a cost. On Prezi, you can enjoy a 30-day trial to create presentations for free. Possibly the most similar presentation software on the list to PowerPoint is Google’s Slides, which can be accessed through Google Drive. Google Slides is a free alternative which makes use of the standard features such as transitions, which helped positioned PowerPoint as a favorite in the past. On Google Slides, you can invite your friends or colleagues to edit the presentation simultaneously making it perfect for work and education. Keynote is Apple’s take on a presentation software rivalling, both Microsoft and Google in the process. Keynote can be described as a powerful presentation software alternative and comes as part of Apple’s iWork Office Suite. Apple’s Keynote is a slide-based presentation tool and resembles Microsoft’s PowerPoint in more ways than one. Like PowerPoint, Keynote allows you to apply unique transitions and effects to your slides. Keynote is a more advanced PowerPoint alternative, due to its cloud-based service, support for interactive templates and high-quality models. Keynote does come free if your Mac runs Mac OS X Mavericks, if not, then this PowerPoint alternative will cost you $19.99. As we’re talking about great presentation software alternatives, it would be rude not to mention ourselves. If PowerPoint is seen as the “basic” presentation tool, think of Moovly as the creative one. Moovly is an animation presentation software, completely cloud-based and free to use! If you want a PowerPoint alternative, that integrated animation and presenting, then Moovly is the one for you. Moovly recently launched a brand new mobile app which gives you full access to a range of pre-animated templates, all fully customizable. Moovly also just launched a new Video Generator which allows companies, brands and organizations to automatically generate video presentations from user generated content videos using data feeds coming from any source. Oh, did we mention that Moovly is completely free? 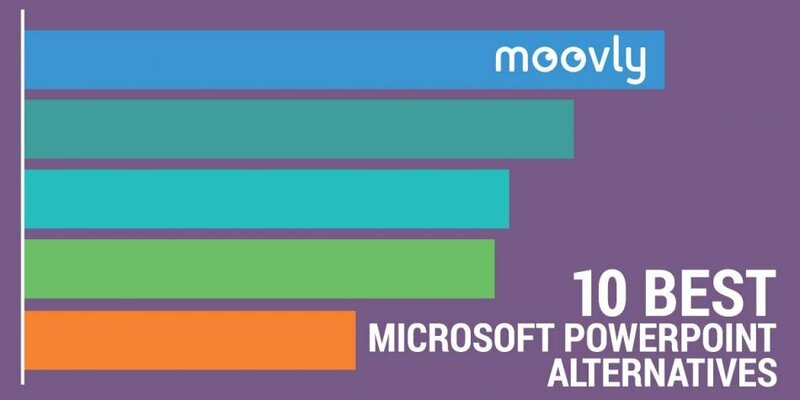 Unlike the majority of the other presentation tools on this list, Moovly offers an entirely free license rather than a trial. Sign up today to get started on your animated presentations. KnowledgeVision is a relatively new PowerPoint alternative compared to the other presentation platforms on this blog. KnowledgeVision helps users to combine online presentations with the impact of video storytelling. KnowledgeVision allows you to create videos for your presentations within the platform itself. KnowledgeVision is like a “one-stop shop” with a suite of integrated tools that will take your presentation game to new levels. You can create free presentations on KnowledgeVision using one of their solutions. Although most will still identify SlideDog as a PowerPoint alternative, it does actually give you a different take on presenting altogether. SlideDog lets you take all of your documents, pictures, videos and even presentations, and places them into a “playlist,” creating a final presentation. As opposed to many of the other presentation tools featured in this blog, SlideDog lets you upload just about any type of file. You can even download a Prezi presentation and use it on SlideDog! SlideDog is a free presentation software alternative with the option of upgrading to a Pro license. Up next is Haiku Deck, which is available for iPhone, iPad, and Web-based users. Unlike Moovly and Prezi, Haiku Deck is a minimal PowerPoint alternative renown for its simplicity. Like on PowerPoint, Haiku Deck allows you to add images, insert text, select a master layout, insert new slides, export and present your presentation. Haiku Deck offers a free 7-day trial for you to create presentations for free. SlideShark is very different from the other presentation tools we featured above, but nonetheless, we decided to add it. SlideShark is an app that allows you to present and share your PowerPoint presentation via any of your chosen devices. Sales executives mainly use SlideShark due to its cloud storage integration and ability to present over the web. For the time being, SlideShark only offers a 30-day trial for you to create free presentations. Have you heard of SlideRocket? ClearSlide purchased SlideRocket a couple of years ago, incorporating all of their features in the process. ClearSlide is another great presentation software alternative for sales executives. The tool is more focused on the sales aspect and tracking rather than the actual creative presentation side. Similar to Slideshark, Clearslide only offers a 30-day trial for you to create free presentations. CustomShow is a multimedia presentation tool designed to help organizations manage and deliver presentations. CustomShow is seen as a premium presentation tool which allows organizations to build quality branded presentations.